The Supreme Court of Pakistan, through its Law and Justice Commission (LJCP), hosted an International Symposium on “Creating a Water-Secure Pakistan” in Islamabad on 19-21 October, in response to the country’s water crisis. Pakistan’s per capita surface water availability has declined from 5,260 cubic meters per year in 1951 to approximately 1,000 cubic meters in 2016, and according to the World Resources Institute, is at number 23 out of the top 33 water-stressed countries by 2040. The Pakistan Council of Research in Water Resources has opined that Pakistan may run dry by 2025 if the present conditions continue. 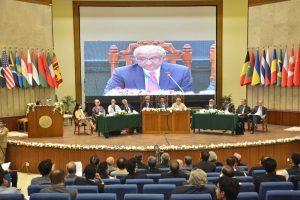 The symposium is an initiative of Pakistan’s Chief Justice Mian Saqib Nisar and was inaugurated by the President of the Islamic Republic of Pakistan Dr Arif Alvi. The Chief Justice highlighted the importance of the symposium, saying it will help create mass awareness on issues relating to water shortage in Pakistan and spark immediate remedial measures. The LJCP invited Australia’s leading water experts, amongst other countries, to participate as keynote speakers and panelists to share their views, experience and global best practices to improve water security in Pakistan in relation to the four themes of the symposium: Legal aspects of Indus basin water; construction and finance of dams and reservoirs; ground water, water recharge and water pricing; and water governance and management. The invitation reflects the Government of Pakistan’s knowledge of Australia’s globally recognised expertise in the water sector and status as a longstanding preferred Pakistan water partner. Australia has earned this reputation through its water management reforms in a water scarce country under a federated system. This is backed up, in-country, by the Australian Water Partnership (AWP) initiative and notably the Sustainable Development Investment Portfolio (SDIP) program (CSIRO/ICEWaRM) and a number of ACIAR funded groundwater projects. With the endorsement of the Australian High Commission and support of the AWP, Professor Rob Vertessy of Global Change Advisory was one of the experts nominated by the Australian Government to represent the cadre of Australian water experts, under the direction of DFAT’s Lead Water Specialist Dr John Dore who presented a whole-of-basin approach to water management using the Murray-Darling Basin as an example. 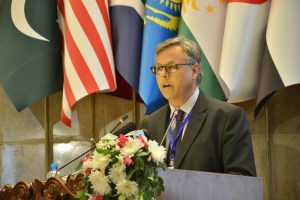 Prof Vertessy shared his views on pathways to water security and the important role of water information. He also provided a summary of Australia’s last 30 years of water reform and success factors, stressing the importance of multi-faceted water reform, patience, capability development and leadership. 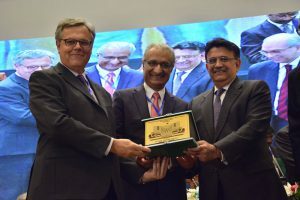 The symposium was a significant event for the Pakistan water sector – involving several members of the judiciary, the Pakistan President, senior officials of the water-related civil service and the media – and resulted in the release of a 20-point declaration from the Supreme Court, urging the nation to initiate various water reforms such as the building of new dams and the creation of an Indus Basin Authority. The symposium also highlighted productive opportunities for deepening the Australia-Pakistan relationship on water, with many participants remarking how relevant the Australian story was to Pakistan. “There is renewed energy emerging for water reform in Pakistan. Though mainly centred around dam building, I think it will lead to deeper and more productive policy explorations in the months ahead. This is demonstrated by the breadth and strength of the symposium declaration,” says Prof Vertessy.